I have always been a big fan of Halloween and the magic that can be themed around this special magical holiday. The Crystal Silk Cylinder illusion has been in my Halloween shows as an open for many years. I would like to share the basic routine with you without giving away the whole thing as you never know just how many “Muggles” read this blog. You need: a Crystal Silk Cylinder with the additional tube, 3, 18” silks that match the colors on traditional candy corn Yellow, Orange and White, one bag of candy corn and a medium sized jack-o-lantern candy bucket for trick or treating. You can even decorate the tube with Halloween themed Scrapbook paper from any craft store. 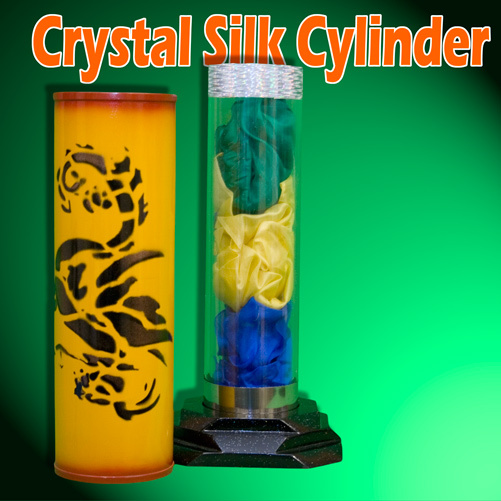 The candy corn is loaded into the load tube on the Crystal Silk Cylinder and everything is set up on your table with the Crystal Silk Cylinder ready to perform. You produce the silks in your favorite method, my method is straight from Rice’s Silk Encyclopedia using a square knot and rolled up to be produced one at a time with the flick of the silks. This makes for a great magical start. As you hold the tied silks, you blow on the square knot, making the knot dissolve and place the untied silk on your table next to the Crystal Silk Cylinder. After producing all three, untie them and show the Crystal Silk Cylinder empty by doing the secret move and showing the tubes using your best display move. Place the silks into the tube in the order of the colors of the candy corn. Place the additional tube on the Crystal Silk Cylinder to hide the silks. Then place the main load tube onto the base. Say your favorite magic words… “Trick or Treat!” and remove both tubes to show that the Crystal Silk Cylinder is filled with the candy corn. The candy bucket is then held lower than the tube and the candy is poured in. If you pour the candy in the bucket with your hands a little farther apart, the noise and look of the effect is such that there will seem like there is a lot more candy than actually is as it pours into the bucket.